Jean Trimbach was in ely winebar 22 Ely Place last night hosting an intimate wine tasting dinner in the new private dining room. Guest were treated to a selection for his finest wines from the classic Riesling up to the Cuvee Frederic Emile. Standout wines from the evening included the aperitif- Muscat Reserve 2009 which was grapey, fragrant and fresh; the Riesling Reserve 2006 surprising even Jean himself – rich yet beautifully balanced despite coming from an admittedly difficult vintage. Of the two CFE Rieslings, 2005 was more forward and immediate, but for me the star was the 2004. 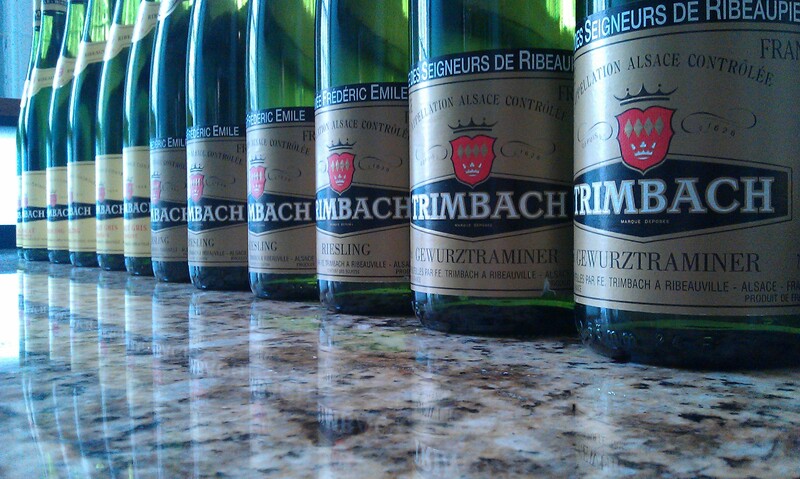 Remarkably concentrated, yet, like all Trimbach wines, possessed with a seemingly inbuilt finesse and elegance. The bright, minerally core gave way to fresh grapefruit and white peach on the palate, and superb length. And it has years ahead it. Last wine of the evening was the Gewurztraminer ‘Cuvee des Seigneurs de Ribeaupierre’ 2001 which was wonderfully rich and perfumed, clearly gaining in complexity over the years yet showing no signs of getting old. The wines were tasted over a dish of Organic Burren Suckling Pig with cider potatoes, celeriac and apple, and the dish brought out something different in each wine. Our thanks to Jean for sharing in an evening of good conversation, great food and wonderful wines. And singing….. we must include the singing! Burgundy can be the most complicated of all regions- despite using only one grape! One of Ireland’s foremost Burgundy experts Charles Derrain will present a class on navigating the minefield that is Burgundian reds- covering winemakers, villages and vintages. No country in the ‘New World’ as embraced regionality more than Australia, and the result is a new generation of wines that express distinctive, characteristics. Along with John McDonnell of Wine Australia, we will compare(and contrast!) the great wine regions of Margaret River, Victoria and Barossa. Two of the most underappreciated wine making countries in Europe will be showing off their finest exports, Riesling and Gruner Veltliner. If you’re fan of serious white wines this is one you will not want to miss. Italy has recently become home to some of the most exciting white wines on the market, the majority of which come from relatively unknown native grapes like Falanghina, Greco, Trebbiano, Garganega, Cortese and many others. We will cover Italy north to south, looking at the best of these wonderfully diverse wines. Aldo Vajra is a traditionalist, saying that “traditional wines are more elegant, with more delicate perfumes and offering more pleasure at the table.” His wines aim not for the power found in some Barolo, but for texture, a Burgundian intensity and a purity of flavour that makes them stand out in Barolo. Join us for a tasting of these remarkable wines, which will be enjoyed-as they should be- over dinner.